The flame test carried out on a copper halide. The characteristic bluish-green color of the flame is due to the copper. A flame test showing the presence of Lithium. A flame test is an analytic procedure used in chemistry to detect the presence of certain elements, primarily metal ions, based on each element's characteristic emission spectrum. The color of flames in general also depends on temperature; see flame color. The test involves introducing a sample of the element or compound to a hot, non-luminous flame, and observing the color of the flame that results. The idea of the test is that sample atoms evaporate and since they are hot, they emit light when being in flame. Bulk sample emits light too, but its light is not good for analysis. Bulk sample emits light primarily due to the motion of the atoms, therefore its spectrum is broad, consisting of a broad range of colors. Separate atoms of a sample present in the flame can emit only due to electronic transitions between different atomic energy levels. Those transitions emit light of very specific frequencies, characteristic of the chemical element itself. Therefore, the flame gets the color, which is primarily determined by properties of the chemical element of the substance being put into flame. The flame test is a relatively easy experiment to set up and thus is often demonstrated or carried out in science classes in schools. Samples are usually held on a platinum wire cleaned repeatedly with hydrochloric acid to remove traces of previous analytes. The compound is usually made into a paste with concentrated hydrochloric acid, as metal halides, being volatile, give better results. Different flames should be tried to avoid wrong data due to "contaminated" flames, or occasionally to verify the accuracy of the color. In high-school chemistry courses, wooden splints are sometimes used, mostly because solutions can be dried onto them, and they are inexpensive. Nichrome wire is also sometimes used. When using a splint, one must be careful to wave the splint through the flame rather than holding it in the flame for extended periods, to avoid setting the splint itself on fire. The use of cotton swab or melamine foam (used in "eraser" cleaning sponges) as a support have also been suggested. Sodium is a common component or contaminant in many compounds and its spectrum tends to dominate over others. The test flame is often viewed through cobalt blue glass to filter out the yellow of sodium and allow for easier viewing of other metal ions. The flame test is relatively quick and simple to perform and can be carried out with the basic equipment found in most chemistry laboratories. However, the range of elements positively detectable under these conditions is small, as the test relies on the subjective experience of the experimenter rather than any objective measurements. The test has difficulty detecting small concentrations of some elements, while too strong a result may be produced for certain others, which tends to cause fainter colors to not appear. Although the flame test only gives qualitative information, not quantitative data about the proportion of elements in the sample, quantitative data can be obtained by the related techniques of flame photometry or flame emission spectroscopy. Flame atomic absorption spectroscopy Instruments, made by e.g. PerkinElmer or Shimadzu, can be operated in emission mode according to the instrument manuals. Gold, silver, platinum, palladium, and a number of other elements do not produce a characteristic flame color, although some may produce sparks (as do metallic titanium and iron); salts of beryllium and gold reportedly deposit pure metal on cooling. ^ a b Jim Clark (2005). "Flame Tests". Chemguide. ^ "Atomic Absorption (AA)". Perkin Elmer. Retrieved 2 May 2013. 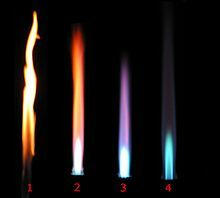 Wikimedia Commons has media related to Flame test.